Killer Banshee Studios & killer banshee - who are they? what are they up to? Chk out current projects & pieces for sale! So busy it is hard to get the site updated! Find more here as soon as I get to it! Watch for continuing updates in the coming weeks & if you can't find something, feel free to email the . ACT-UP 25 years. Thought we would put the Unleashed Power piece on the front page in honor. If you didn't see the last 8 minutes of TRMS (The Rachel Maddow Show) today, go find it online. If you need a full resolution video file/clip for review . While the piece has evolved since this performance, this performance being that it was the world premier & that it was at Le Petit Versailles is one I'm rather attached to. 4/24 alert:: just found out that there is a $$$ thing. $10 adv/$12 at the door. It is likely to sell out. 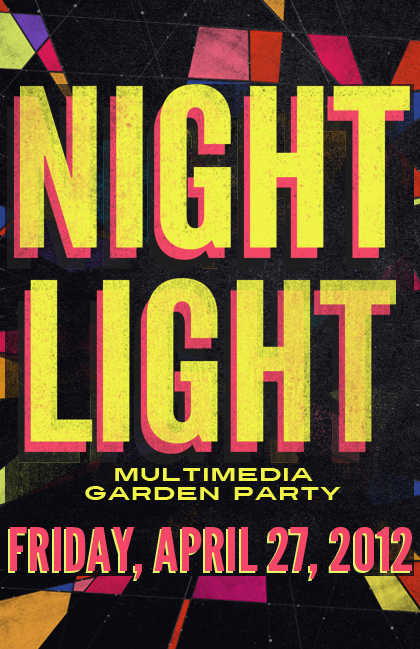 4/27 alert:: it is sold out. they are letting in ppl at the door on a 1-in-out as others leave. 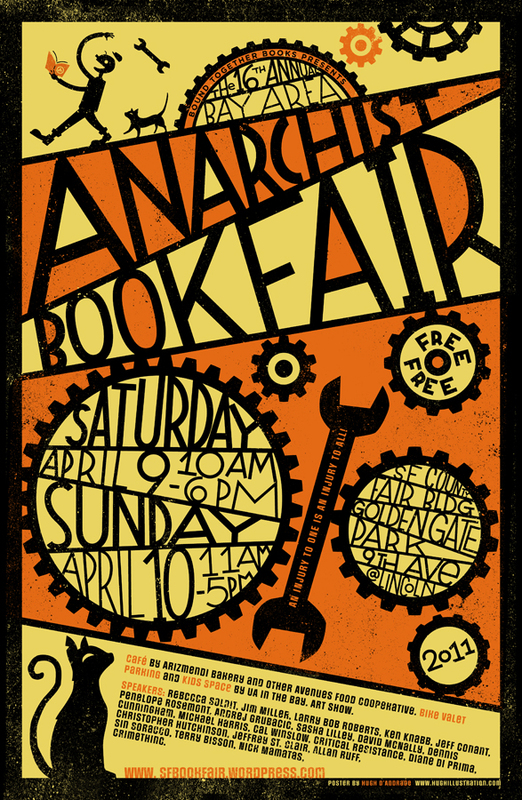 Don't forget to visit Fly & Killer Banshee Studios at the 17th Bay Area Anarchist Bookfair. We will be in our usual spot. And the Anarchist Bookfair is in its usual spot - Golden Gate Park Hall of Flowers aka County Fair Building in SF...just in from Lincoln Ave.
Saturday, October 22, 2011 Doors: 7.30, Show: 8pm. We'll be doing live video all night. 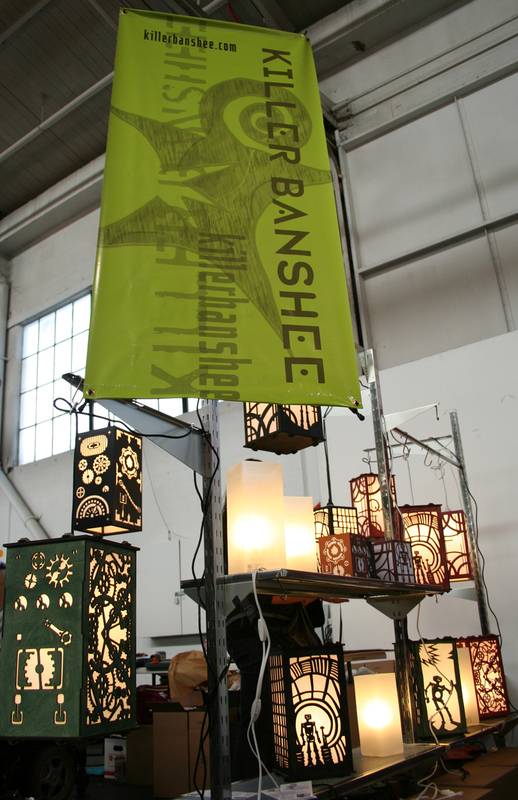 killer banshee's new Shoji Lamps coming online! If you missed the Renegade Craft Fair SF or if you were there, but you didn't buy the fantastic lamps there. You can now find them online! We'll be honoring the coupon code from our RCF Flyer through August. Fort Mason, San Francisco on July 9-10, 2011 from 11-7 both Saturday & Sunday. We'll be doing a HUGE introductory sale, so don't miss it! killer banshee + Eliot K Daughtry & Kriss De Jong individually are showing at ABC NoRio in the LES NYC as part of the Cocktail Party show. Opening reception: May 12, 2011. ABC NoRio 156 Rivington St. Lower East Side, NYC. 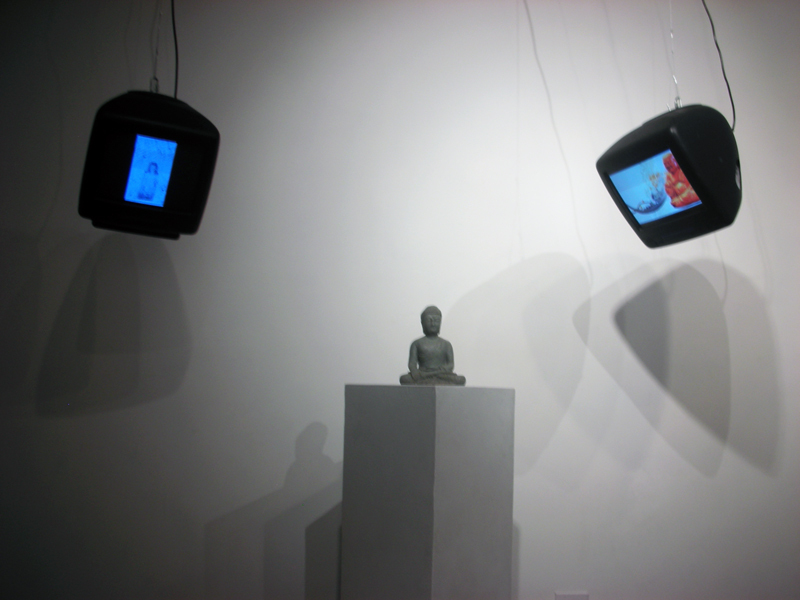 killer banshee will be installing their Network Buddha piece for the 5th annual TV of Tomorrow Show, May 17 - 18, 2011 at Yerba Buena Center for the Arts. It is a brief show, so make sure to mark your calendars! You don't want to miss it. 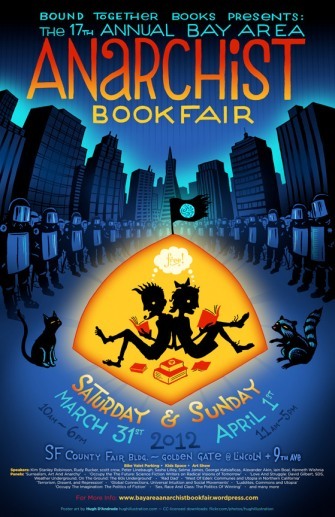 killer banshee & Fly will be in their usual spot at the 16th Annual Bay Area Anarchist Book Fair at the SF County Fair Building (Hall of Flowers) , Golden Gate Park. The 12th Annual Bring Me the Head of the Chocolate Bunny Day will be here before you know it. Get your Bunny Head offerings ready! The SF Camerawork show is opening September 9, 2010 with a reception from 5-8pm that evening. See more here. We will be unveiling the first installational version of Unleashed Power! 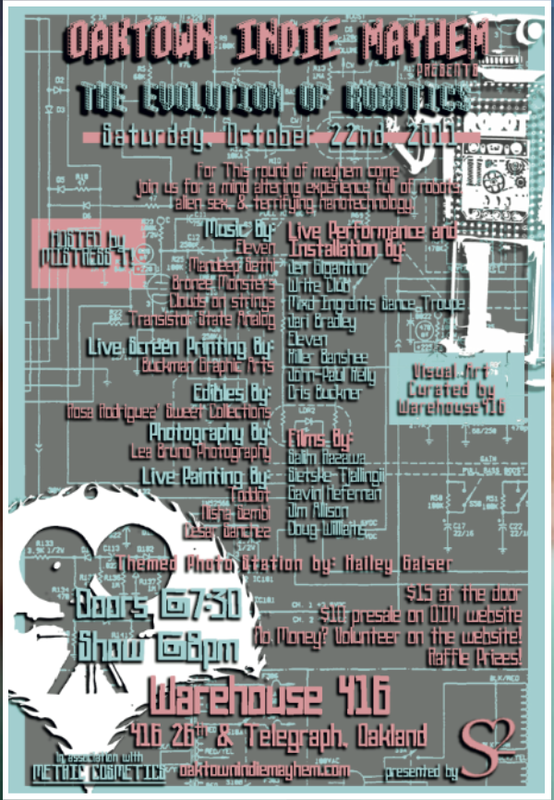 We've been curated into a show this coming September at SF Camerawork. More info coming soon. Save the date! 21 Grand & Killer Banshee Studios announce the selected videos for the 10th Annual T-10 Video Festival make sure you have it on your calendars to join us July 15 (Thursday) & 16 (Friday), 2010. Doors 8pm, Show 8:30pm. You can read all about this years selections on the T-10 site. 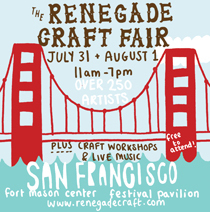 Killer Banshee Studios is happy to announce we've been juried into this years Renegade Crafe Fair in San Francisco. Join us on July 31 & August 1, 2010 at Fort Mason Center in SF. 21 Grand & Killer Banshee Studios announce the 10th Annual T-10 Video Festival call for entries. Get your submissions together & take a look at the call for entries. Deadline June 4, 2010. 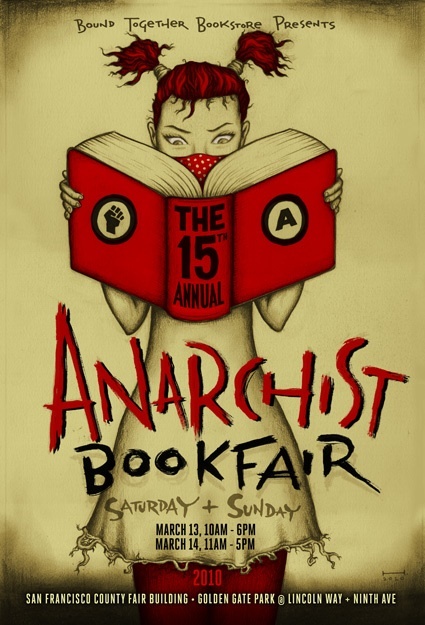 Killer Banshee Studios & Fly will be sharing their wares & ideas with the world at the 15th Annual Anarchist Bookfair in San Francisco. Come & visit them. 9th Ave at Lincoln Way in the Countyfair bldg in Golden Gate Park. March 13th 10am-6pm, & March 14th 11am-5pm. Most of the world's robots are industrial, but most of the ones we imagine look like humans. Why do we think about one and use another? How can a robot be a human and also be an artificial intelligence? Why are we comfortable with some robots, but find others creepy? Why are more robots male than female? 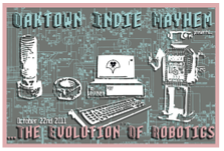 This presentation will discuss major areas of the Robot Taxonomy Project, an ongoing effort to classify all types of robots and why humans create them. Whatever are you going to do for all of the presents you need? Check out the Killer Banshee Studios shop or our Etsy store. Continuing its mission to identify, classify, document and promote better understanding of robot types and their relationship to human forms, the Robot Identification Institute will be open to the public for the month of November. The temporary office will be located at 21 Grand, an interdisciplinary art space located in Oakland California. The office will take reports, provide alerts about unusual robot activity, and expand the Robot Taxonomy. The RII will debut new bas-relief works as an upgrade to our space! 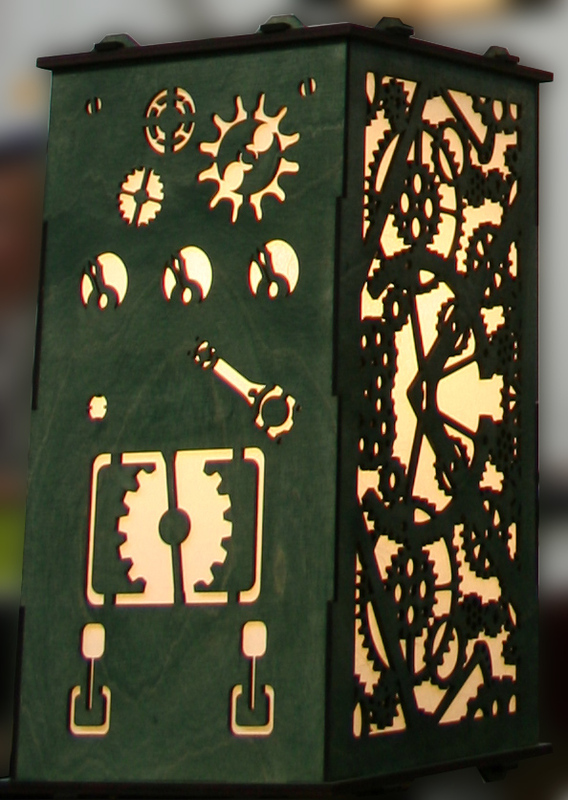 These carved panels represent different robots taken from the classes of the taxonomy. Show is open thru Dec 6.
killer banshee is part of the All-Star Projectionist Jam at the Oakland Underground Film Festival at the art deco movie theater at Alameda point naval base, Alameda (2700 Saratoga St, Alameda). This is an extension of our Illuminated Corridor project. Excerpts from killer banshee's Mobility will be playing at Swarm's filmnight 4.0. oakland ironworks parking lot (3rd street between clay and jefferson, Oakland) an evening of artifacts from the bay area's live cinema milieu highlighting the work of musicians who are making unique statements in the world of film. expect bbq. This is an extension of our Illuminated Corridor project in collaboration with Swarm Gallery. An advanced heads up - Eliot has a solo show opening at 21 Grand on November 6, 2009. Artist reception/opening is 7-10pm Nov 6. Show is open thru Dec 6.
killer banshee is involved in The WEDLOCK Project, Part 1: ENGAGEMENT show is just 10 days away. The opening is on Friday, Sept 25th, 2009 from 6-8pm at Space 242 in Boston's South End*. The world premier of the performance piece "Romeos" will start promptly at 7:00 pm. Please RSVP directly to the gallery. We unfortunately won't be there in person (see next newer post). Check out Adrienne Skye Roberts writing on SF MOMA's blog of Across Queer Time & our performance as a part of it. 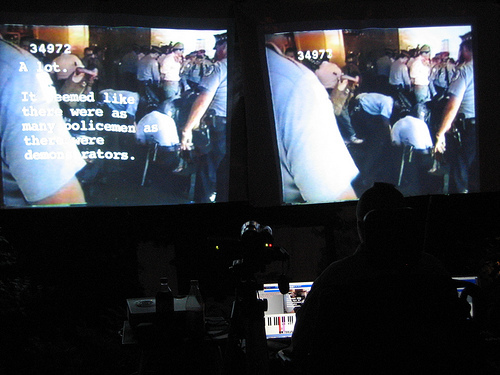 We are co-curating the 2009 T-10 Video Festival w/ 21 Grand. The T-10 festival call for entries is here. EXTENDED Deadline for entries is June 10, 2009. The T-10 Video Festival will be July 16 & 17, 2009. We have quite a few shows coming up this Spring/Summer. Check out the shows page for details. 6/12--9.03pm Estuary Art Attack - an ext of the collaborating artists of Illuminated Corridor 2513 Blanding Ave, Alameda. A new collaboration w/ rhythmix cultural works, big city orchestra, cinepimps, killer banshee, nux vomica. Exterior cinema w/ interior sound on the corrugated facades surrounding rhythmic cultural works. Continue to check back as others get confirmed. The End of the Analog show w/ our performance of Wake for Analog went great (ATA 5/23/09). Documentation will be available here soon-ish. Illuminated CCorridor "Subtidal Goals" also went really great though it was FREEZING! Documentation will be available here really soon. 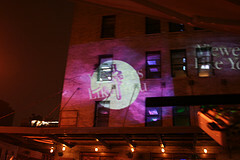 Check out photo & video documentation from our NYC shows. killer banshee will be heading out on the road for multiple New York shows. We're still debating doing shows in other cities on our return as we're exhausted from 2 years of grad school non stop ness. Killer Banshee Studios was comissioned to create 12 art pieces & various additional architectural details for a new building at 853 W Grand in Oakland (right next to the studio). Check it out in person if you can. Otherwise we continue to add pictures to the gallery. More & more knitted monster & robot patterns are coming online. You can check out pictures of them & order patterns. Don't forget that there are many goodies that you can get from the Killer Banshee Studio creative hive. You can find show listings under the specific medium areas...like video, or look at all shows listed together on the calendar. Recent/past shows can be referenced here too. Subscribe to the Killer Banshee announcement list "The Killer Banshee's Scream"
to keep up to date on goings on.